1. Before mixing all of your ingredients, you’ll want to caramelize the onions. First, cut the top and bottom of the onion, then halve and peel the exterior layers. Slice the onion to your desired thickness (the thicker the slices, the longer the onions will take to caramelize). Heat the olive oil in a large pan. Once the oil is hot, add the onions, stirring to coat everything. Keep the temperature around medium-high, allowing the onions to char if you desire. At this point, you can add a pinch of kosher salt to accelerate the caramelization process. Once the onions begin to turn translucent, you can turn the temperature down. Keep stirring the onions occasionally. Add brown sugar. Continue cooking until the onions are soft and dark brown. This will take around 30-45 minutes. You can cook the bacon and put everything else in the bowl while the onions are going. 2. 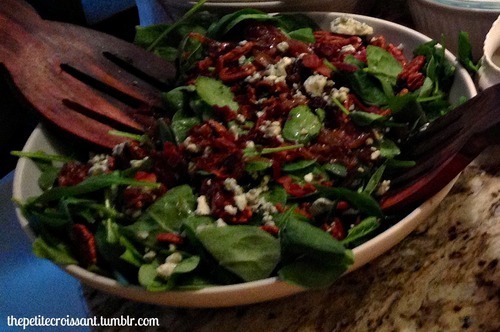 Place the bag of spinach in a bowl. Put the bacon, caramelized onions, apple, blue cheese, and pecans on top. 3. Mix the olive oil and balsamic vinegar in a jar and pour evenly on the salad.